Also there is a lack of standardization of operations at Lonsdale Fitness and the different training levels have reduced the quality of the customer experience as well as safety. This makes it difficult to plan for the future as each fitness centre currently makes many of their own decisions. 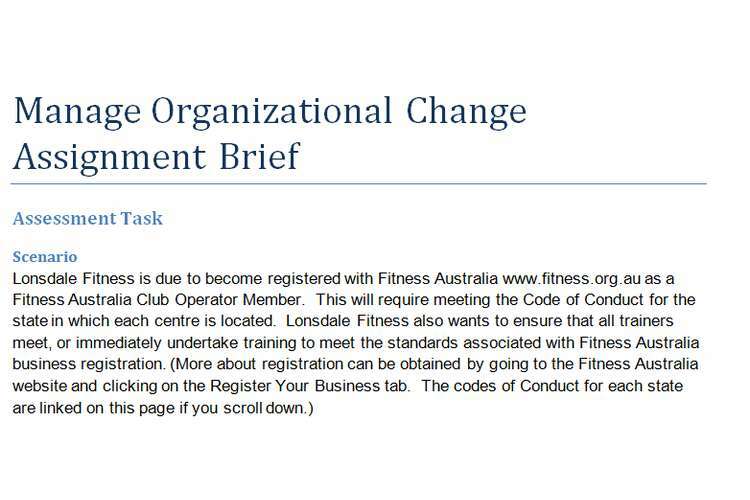 Lonsdale Fitness requires you to act as the Change Manager for a new initiative to be undertaken at all Lonsdale Fitness Centers. Your job is to prepare a plan to implement a widespread business change. The membership payable to Fitness Australia is: $830 for the first centre and $535 for each linked centre after that with a $105 joining fee applied to each centre for first time membership. There is no stipulation as to trainer numbers outside those in the Code of Practice (recommending a registered exercise professional be on the gym floor during opening hours; or where outdoor group exercise/PT is being offered where the recommended ratio is 1:18). Registered businesses complying with the Code will only employ registered exercise professionals. Individual exercise professionals must also be registered. This is $190 + GST for 2 years. In the 2 years they are required to complete 30 professional development points before renewing their registration. The minimum educational qualification currently necessary for all trainers is the Cert III in Fitness Instructing and all trainers must hold this to continue to work as a trainer of classes and individual clients. Up to now this has not been consistently applied. In Perth all are qualified; In Sydney 2 requires basic training, as well as 2 in Canberra and 1 in Adelaide. It is intended under the change management that all trainers, once they have completed the basic training, should continue to pursue further training in Certificate IV and Diploma, as part of their professional development. Detail what the project will achieve. Ethical issues that need to be considered and how the change plan will address them. what are the main elements in the change plan? [E.g. people/culture, systems/technology, documentation, positions/roles, process, skills] Each of these elements may require a particular focus in the change plan. List the drivers and constraints for change. Explain what kind of risks the change process may face? Identify the preferred media for communicating or consulting with them about the change [e.g. sessions involving dialogue about the changes, newsletters, briefings from project team members, frequently asked questions]. What elements might support the change [e.g. dissatisfaction with current processes; a workplace culture that supports change and innovation]. Assess the employee’s readiness for change. Is there strong senior support for the change? What methods should be used for the assessment of readiness? Presenting changes in a positive light even whilst acknowledging loss. Consider the need for change in the support structures [e.g. a change team, super users/specialists who are trained first and can support people in the workplace, involvement of users/key stakeholders at various stages, change champions in the workplace]. Consider if there is a need for transitional arrangements to support and whether the introduction of the change process needs to be done in stages. What will be the impact on workloads and how will these be managed? Ensure policies, procedures and performance measures reinforce the changes. Remove organisational barriers to the change. Reinforce how changes have provided benefits. How will the change be evaluated in relation to the achievement of the planned objectives? How will the change management processes be evaluated – consider summative as well as final evaluations planning, how can you assess your change management strategies as you implement them? How will the evaluation outcomes be circulated and promoted to stakeholders? How will evaluation outcomes be used in other organisational processes?